Plum Granny Farm Weekly Update -- Sunny, Busy Week! Posted 1/23/2015 1:52pm by Cheryl Ferguson. Looking out the window on this cold, bleak, rainy day, it's hard to believe how incredibly nice the weather has been this week. But it was truly wonderful and enabled us to get a lot of things done around the farm. Lots of pictures today! The strawberries needed our attention. There was weeding and mulching to be done. Then we got them covered with a nice snug field blanket. We had been resisting getting one of these blankets because of the cost but finally found a good price from an NC dealer. These blankets are huge -- 26' wide and we cut ours to 149' long. It covers all of the field except for one row! The blanket is on just one of the two fields -- we are debating if we want to conduct an experiment between the two fields (intervention and control) or cover both.... We'll let you know! The asparagus beds were also mowed this week. We mow them with the sickle bar and then rake out all the debris for burning. Burning the debris off-site helps control pests and diseases that might have been harbored in the foliage. After this step, we begin the labor intensive process of hand weeding the beds. Since we are organic, we don't use herbicides like most farms do -- it's very slow, tedious work but we think you appreciate having asparagus without a side of chemicals! It sure seems that we are either taking things off of our fields or putting things on them, doesn't it?! I promised last week to show you how we roll out big round hay bales over the artichoke beds -- I found the photo on Ray's phone! Don't forget to mark your calendar for our Valentine's Day Event on Saturday, February 14 from 10-2! We are getting our paperwhite narcissus and other things all ready for you! We hope you celebrate National Pie Day today! Chocolate, lemon, pecan, chicken -- whatever your choice! After enjoying a nice slice of pie, you could just curl up in a nice warm place, and take a nap -- like Ajo! Plum Granny Farm Weekly Update -- Welcome 2015! Posted 1/16/2015 10:51am by Cheryl Ferguson. Happy New Year, everyone!! Hope the beginning of 2015 has been good for you. Now that hopefully we are past the flu, breaktime is over and we are kick starting the new year! The garlic is doing GREAT! Lots of green out in the field and we have already done some weeding. Ray took the flame weeder out and eliminated a lot of weeds before they got a chance to get big. The nice thing about garlic is that you can flame it and even if you nip the leaves with a bit of heat, they still are okay. Ah, the resiliency of plants! Another task we have tackled is to get the artichokes ready for winter. The plants had survived the earlier wintry blasts but we needed to tuck them in for sustained cold. Our artichokes are started from seed and we are able to get two seasons of production -- nice, huh? We trimmed back the foliage (in their various states of growth), expanded the hole in the fabric if the crown had gotten a lot bigger than the original hole, and then covered them in a heavy layer of hay. We roll out big round hay bales over the beds -- makes for an amusing sight (and I don't seem to find our photo!) But here are a few pictures to show how it's done. Mark Your Calendar for Our Valentine's Day Event! On Saturday, February 14 from 10-2, we are hosting our first Valentine's Holiday Market! We will have lots of our products available in the greenhouse (from jam to flowers) and we'll have other vendors as well. You’ll find an assortment of ways to treat your Valentine to a nice gift! Stop by and take care of your Valentine’s Day shopping – and keep it local! We'll be sending along more information as we get closer to the date -- but mark your calendar now! That's all for this week! There are lots of special days to celebrate over the weekend starting with "Ditch New Year's Resolutions Day" today, or "Winnie the Pooh Day" on Sunday. More importantly, let's celebrate the life of Dr. Martin Luther King, Jr. on Monday and honor his memory by doing something to make a difference in the lives of our neighbors. Plum Granny Farm Weekly Update -- Happy Garlic Holidays! Posted 12/19/2014 8:10am by Cheryl Ferguson. This will be our last edition for the year -- we're taking a few days off to relax over the Holidays. Thank you for supporting our farm and for sharing what we are doing here by reading our newsletter. We really appreciate your words of support and encouragement as well as your business! And most of all, we are most grateful for your friendship and trust. Here's wishing you all the most wonderful Holiday Season ever! Happy Hanukkah, Merry Christmas, Joyous Solstice and all good wishes for a Happy & Healthy New Year!! Plum Granny Farm Weekly Update -- Last Cobblestone Market for 2014! Posted 12/11/2014 1:14pm by Cheryl Ferguson. Another busy week on the farm! Although this week has been a bit more oriented to indoor tasks than out. Yesterday was the day for our annual Organic Certification inspection. Whew! We submitted our plan back in August and were waiting to hear about the on-site inspection. Late last week we got the call from our certifier -- Wednesday was the day! Our Organic Systems Plan is an extensive document but it is only part of what we must do for certification. The on-site inspection is very thorough and involves a complete farm walk as well as reviewing our documentation -- half a day at least. One of the parts that we have to be prepared for is to show our all crops from seed to sale -- a complete audit of when we seeded, when and how much was planted, what was harvested and how much we sold. It takes a LOT of preparation -- but we think we did fine! We should be hearing back from the certifying agency in a month or so. Keep your fingers crossed! Garlic Update: No it's not all planted yet....We decided to let the soil continue to dry out and to give us time to sort through the cloves of cracked garlic and pick out the biggest ones for planting. There may be a crop mob late next week so stay tuned! Just wanted to remind you that as you are doing your Holiday shopping for friends and family outside of the immediate area, we can help! Our jams & garlic products make great gifts and we are happy to take care of the wrapping and shipping for you! Santa's purple elves to the rescue! Thanks for all of the well wishes for Wally! He seems to be very happy in his new home and his new family has sent a couple of photos along. Had to share this one with you -- do you think he is going to be spoiled? This week's market is the final Cobblestone Farmers Market Pop-Up! It's on Saturday (12/13) in the parking lot behind Mary's Gourmet Diner (7th & Trade in Downtown Winston-Salem) from 10-noon. You'll find all kinds of great things on our tables -- many perfect for gift-giving! Enjoy Poinsettia Day tomorrow! Take a trip up to visit our friends at Mitchell's Nursery & Greenhouse in King and feast your eyes on their huge selection of poinsettias. They grew over 8000 this year and you can vote on your favorite variety as part of the national poinsettia trials. Plum Granny Farm Weekly Update -- It's Pop-Up Market Time! Posted 12/5/2014 12:09pm by Cheryl Ferguson. It seems like it has taken an entire week to recuperate from the FABULOUS Small Business Saturday Holiday Market and Open Greenhouse. Wow! What an amazing response we had! We estimate that nearly 300 people came to the farm to support local farms and producers and to Shop Small for the Holidays -- and we are so grateful for your support! We were seriously rocking the greenhouse from the beginning to the end of the day!! Despite all of the recuperation needed from our Really Big Day, we have managed to get some garlic in the ground this week. The conditions are still dreadful but it's gotta get in there!! Here's Chris planting while Ray shapes beds on the tractor. Chris has almost been a one-man planting machine! Thanks Chris -- you rock! And here's an update on our search for a home for Wally -- we found him a wonderful home with the May Family of Kernersville! He'll have two little people to play with now and will be shielded from the dangers of Flat Shoals Road. His new mom says he will really be spoiled. Thanks so much, Cheyenne & family for giving him a great home! 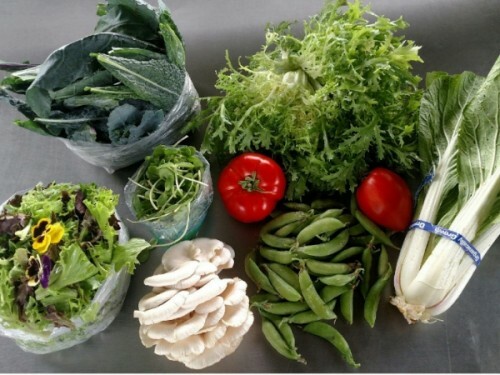 This week's market is the Cobblestone Farmers Market Pop-Up on Saturday in the parking lot behind Mary's Gourmet Diner (7th & Trade in Downtown Winston-Salem) from 10-noon. You'll find all kinds of great things on our tables -- many perfect for gift-giving! Enjoy Mitten Tree Day tomorrow -- probably invented by a grade school teacher but can be celebrated by all ages. Read The Mitten to young children, add mittens to your Christmas tree or donate some to your favorite shelter. Plum Granny Farm Weekly Update -- Let the Holidays Begin! Posted 11/28/2014 9:08am by Cheryl Ferguson. We hope you had a wonderful Thanksgiving filled with friends, family, relaxation and all the things you are thankful for! Our focus this week has been to get ready for the Holiday Season. It has definitely been a jamming week! Jen and Cheryl spent lots of time at the Camp Hanes kitchen making batch upon batch of your favorite jams. We made large jars and gift-size jars and are all ready for you and your orders! 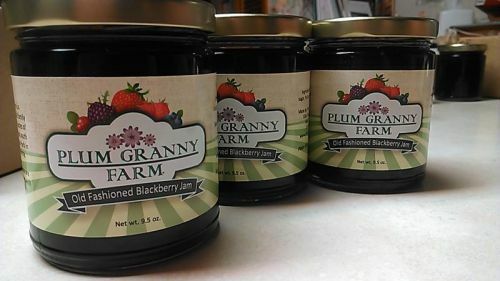 Just as a reminder, check out our website to learn more about the jam that we make -- we now have NINE varieties! And we are happy to ship! We have been harvesting more of the turmeric and will have lots for Saturday's market. Here are Jen and Chris showing off their handiwork! We have been working especially hard to get ready for our Holiday Market and Open Greenhouse event tomorrow (11/29 from 10-4). It's our first time to participate in Small Business Saturday and it has been fun to get all of the cool things they have put together for the day -- everything from posters to balloons and even a welcome mat! We have partnered with Buffalo Creek Farm and Creamery to promote the event at both of our farms. At our farm, there will be a wide variety of products to choose from including baked goods, peanut butters, truffle products, eggs, produce, gift items, photographs, wreaths and more! Help us welcome BeNutty Bakes and Butters, Greenberries Farm, Truffles NC and Front Door Designs by Jonna to our farm! There will even be a campfire for s'mores, refreshments, lots of door prizes and you can even choose & cut your own cedar Christmas tree! Shop Small, ya'll! This week's market is Small Business Saturday at the Farm (10-4)! You'll find all kinds of great things on our tables -- many perfect for gift-giving! Posted 11/14/2014 9:32am by Cheryl Ferguson. Looking at the forecast for the next few days, it sure feels like winter is upon us! Will definitely be a frosty morning at market tomorrow so we'll have on our layers, for sure! Today marks the day for planting shallots. The rain last week created poor soil conditions but it finally dried out enough to get the beds shaped. Ray and Chris (with the help of the NC A&T State University bedshaper) got several beds made up late yesterday so we will be planting French Red and Greeley shallots today! Our shallot crop this year was greatly reduced due to last year's intense cold. We are going to plant a little differently this year and may even add mulch as a protection. The Greeleys in particular were severely impacted last winter and we lost more than 2/3 of the crop. Since this is a rare heirloom shallot that we got from a farmer in New Mexico, we have to rebuild our stock. Here's to 2015! 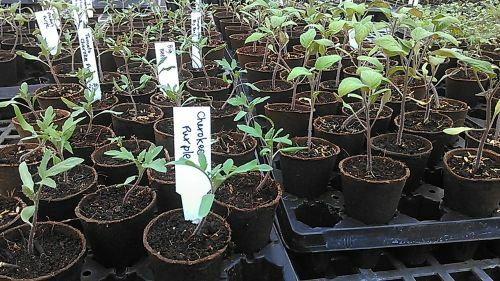 As the weather chills, the more tender plants need protection. We have two lettuce beds in the Demo garden that now have PVC hoops to create a mini-high tunnel and we are putting down floating row cover over the frissé and lettuce in Raz House. And then there are the well pumps to cover, ice machine to winterize and greenhouse irrigation to check, ... The To Do list gets VERY long when cold weather hits! Okay, folks -- we need your help. We need to find a good indoor home for our cat, Wally. He is an affectionate and personable cat but because of these qualities, he is always in search of people and crosses the road to find us. We really don't want him to meet the same fate of his Mom, so we'd like to find a new home for him. Please send an email or give a call if you are interested. We think he would do well with other cats- not sure about a dog. It will be hard to lose him but we'd rather rehome him than have another hit and run victim. Don't forget that Saturday, November 29 from 10-4 is our Holiday Market and Open Greenhouse event on Small Business Saturday. We have partnered with Buffalo Creek Farm and Creamery to promote the event at both of our farms. At our farm, join BeNutty Bakes and Butters, Greenberries Farm and Truffles NC and try their wonderful products! We'll have Holiday mistletoe and greenery, veggies, jams, garlic goodies and more along with Christmas tree cutting, a bonfire for s'mores, refreshments and door prizes! Shop Small, ya'll! On Saturday, we'll be at Cobblestone Farmers Market at Old Salem (9-12) - just one more regular season market after tomorrow! What will you find on our tables? Yes, there's still garlic - smaller quantities -- so get it while you can! There will be Garlic Powder and Garlic Granules (Spanish Roja, Inchelium Red, Nootka & Music), Culinary garlic -- Elephant, Music, Inchelium Red, Chesnok, German Red, Lorz Italian and Nootka Rose -- and garlic braids. We'll also have LaRatte Fingerling potatoes as well as the popular Sweet Potatoes (Ginseng, Covington & Sweetie Pie) -- they went FAST last week! There will be Aji Dulce peppers (the sweet habanero) -- try a taste of our Aji Dulce Sauce -- a zesty and bright Puerto Rican sauce that just begs to go with chicken, beans or pork -- and even chips! We'll have kits with all the makings and a simple recipe. We'll also have jalapeños, Sweet Italian Red peppers, and radishes. Holiday flavors have come to the Jam Department! Our famous, limited edition Yam's Jam Sweet Potato Butter is back (think sweet potato pie in a jar! Yummmmmmm!) as well as the tasty Raspberry-Cranberry Jam. Stay warm, tuck in your furry friends, feed the birds, cover those plants and beware of frozen pipes! Posted 11/7/2014 10:48am by Cheryl Ferguson. The winds of November are blowing in garlic! Well, at least blowing in the need for us to get the garlic organized, cracked and ready for planting. We always try to have it in the ground by Thanksgiving so we have a lot of work left to do. When you have nearly 20,000 bulbs at harvest, it takes a lot of organization to keep things straight. When we harvest garlic, we grade it for size and set aside the largest bulbs for seed. This week we have been spending a lot of time checking the seed for quality as well as going through what's left of the smaller garlic to determine what we will plant and what can go to market. It is a very painstaking and slow process. Lists, paper, markers and tags (and patience) are essential tools in this process (and maybe some tea and a bagel). It's always a bit sad at this time of year when we are clearing the barns of garlic -- it gets so empty!! Remember this? A sad -- but necessary -- sign of the season. Another sign of the season is getting the greenhouse and the hoop house ready for winter. Since we have the hoop house full of nice, tender plants, we need to make sure that it is as free of drafts as possible since it has no heat source except for the sun. We closed up the vents in the top of the house to make sure that as much warm air as possible stays in -- so far it's working pretty well! We still have some tomatoes for market! Mark your calendar for Saturday, November 29 from 10-4 for our Holiday Open Greenhouse event on Small Business Saturday. We have partnered with Buffalo Creek Farm and Creamery to promote the event at both of our farms. There will be vendors at both locations to share their local products for your Holiday giving! More details next week! On Saturday, we'll be back at Cobblestone Farmers Market at Old Salem (9-12). Thanks for your understanding of us not being there last week. What will you find on our tables? Yes, there's still garlic! But -- a word of warning -- we are starting to run out of several varieties so you'd better stock up! There will be Garlic Powder and Garlic Granules (Spanish Roja, Inchelium Red, Nootka & Music), Culinary garlic -- Elephant, Music, Inchelium Red, Chesnok, German Red, Lorz Italian, Bogatyr and Nootka Rose -- and garlic braids. Those yummy LaRatte Fingerling potatoes will be there in bunches! And the first of our tasty Sweet Potatoes (Ginseng & Sweetie Pie). There will be Aji Dulce peppers (the sweet habanero) -- try a taste of our Aji Dulce Sauce -- a zesty and bright Puerto Rican sauce that just begs to go with chicken, beans or pork -- and even chips! We'll have kits with all the makings and a simple recipe. We'll even have some Tomatoes, jalapeños , artichokes and swiss chard. In the Jam Department, we are all stocked up! On Tuesday, please take a moment to remember our veterans and say a word of thanks. Both Ray and Cheryl's fathers were part of the Greatest Generation, serving their country during World War II. We owe a huge debt of gratitude to all of our veterans. Plum Granny Farm Weekly Update - No Old Salem Market This Week! Posted 10/31/2014 10:13am by Cheryl Ferguson. Hello Farm Friends! Happy Friday & Happy Halloween! Quick Market Update: We will NOT be at the Cobblestone Old Salem Farmers Market tomorrow due to the predicted stormy conditions. The weather forecast for the day is quite bleak and although the market will be open as scheduled, we will not be there. Drippy wet garlic braids and garlic powder paste are not things that we want to sell (and we think you wouldn't want to buy them either!) We will be back at Old Salem next week (11/8) and through the rest of the market season there (11/22). As a reminder, the King Farmers Market closed for the season on Wednesday. Despite the impending cold, wet blustery conditions, we are looking forward to some rain. Things are quite crunchy around the farm so we have been irrigating a lot to get our new transplants off to a good start. The bok choy is settling in well! The dry weather has been great to get fields ready for fall planting and cover crops. Ray has been spending lots of time in the tractor(s) seat(s) (we borrow tractors from several relatives to be able to do all of this work). He has been disking, tilling and spreading leaves. This morning he is off to NC A&T to borrow a bedshaper to make beds for our garlic and shallots. We'll also use it to prepare a few beds for next spring -- it always helps to have a few beds ready to go in the early spring when it is usually too muddy and wet to work the soil. Here's a photo of Ray spreading leaves where we will be planting shallots next week. Good news on the strawberry front! We have almost doubled the number of plants! The plants that we had from last year (which were rooted from plants that we had 2 years ago) were doing SO well that we decided to go ahead and keep them for 2015. They are strong and healthy -- and even producing lots of flowers. We didn't have the heart to till them up so we weeded, fertilized and they are ready to grow even more over the winter. As you recall, we lost a lot of our plants last winter due to the weather and the deer but many of them recovered and flourished over the summer. The strawberries are all safely behind an electrified fence and we will probably be getting a field blanket to keep them a bit warmer over the winter. But feast your eyes on this -- there's even fruit on some of the plants now (and it's tasty!) Keep your fingers crossed for next year's crop! More next week on plans for upcoming markets and events. We have lots in store for you! Hope you have a safe and fun Halloween and Dia de los Muertos. I think it's a great weekend for some winter squash soup, don't you? Posted 10/24/2014 3:38pm by Cheryl Ferguson. It's been a plant, harvest and field prep kind of week here on the farm. All of the potatoes are out of the field -- both the sweet potatoes and the remainder of the fingerlings. We were pleased with both harvests -- the fingerlings netted around 800 pounds and the sweet potatoes came in at just under 700 pounds. A respectable harvest! Unlike "Irish" potatoes, sweet potatoes have to be cured in a warm, humid place in order to develop their sugars so they will taste even better. It takes about 7-10 days for them to cure. We put ours in the greenhouse after harvest -- they are now stacked on perforated shelving to make sure air can flow through them. Sweet potatoes are still a fairly new crop for us. Our first year growing them was in 2012 -- very small potatoes and we almost gave up. We didn't grow them last year but planted a pretty good sized area this year. We know that sweet potatoes are somewhat of a commodity crop but we are trying to find some extra tasty and sweet ones for you, our special customers. Next week we should have Covington, Ginseng and Sweetie Pie at market. The main reason we grow sweets is for our "Yam's Jam Sweet Potato Butter." This year the potatoes are nice and large and will be easier to work with than the little rattail ones from 2012. This incredibly smooth and tasty treat will be available starting in November -- just in time for the Holidays!! It's a yummy, not too sweet Sweet Potato Pie in a jar! We've been busy on the planting front as well. More kale, chard and onions are now in the ground. We just planted 804 red and yellow onions today -- these will be ready next spring (nothing like making you wait, huh?) Our hoop house has been transformed from tomato heaven into a cozy abode for basil, frissé, lettuce -- and yes, we still have tomatoes! The plan is for the frissé to be ready for Holiday sales. Speaking of Holidays, we are busy making plans for our activities. Mark your calendar for Saturday, November 29 for our Holiday Open Greenhouse event! This is Small Business Saturday and we will be partnering with other vendors to join us at this very fun and very local event! Stay tuned for more information! On Saturday, we'll be at Cobblestone Farmers Market at Old Salem (9-12). This Saturday there will be extra Halloween activity in Old Salem so there's even more to do after market. Wednesday will be the LAST day of the King Farmers Market season. What will you find on our tables? Yes, there's still garlic! But -- a word of warning -- we are starting to run out of several varieties so you'd better stock up! There will be Garlic Powder and Garlic Granules (Spanish Roja & Music), a few bags of Seed Garlic for planting, Culinary garlic -- Elephant, Music, Inchelium Red, Chesnok, German Red, Lorz Italian, and Nootka Rose -- and garlic braids. Those yummy LaRatte Fingerling potatoes will be there in bunches! Lots of okra (burgundy and green). Tomatoes are still on the menu and we have a surprising number of beautiful slicers and some fruit boxes and Matt's Wild Cherry. There will be Aji Dulce (the sweet habanero) and shishito peppers -- all Certified Organic! Try a taste of our Aji Dulce Sauce -- it is a zesty and bright Puerto Rican saauce that just begs to go with chicken, beans or pork -- and even chips! We'll have kits with all the makings and a simple recipe. We also have a new batch of Basil Pesto! In the Jam Department, we are all stocked up! Get out and enjoy the beautiful fall colors this weekend! Supposed to be gorgeous so head on up towards Hanging Rock and wave as you drive by the farm! !